Calmodulin (CaM), a multifunctional intracellular calcium sensor and signal transducer is encoded by at least three CaM genes in mammals. CaM is particularly abundant in the brain where it plays a pivotal role in neuronal functions such as synthesis and release of neurotransmitters, neurite extension and long-term potentiation (LTP). We demonstrated gene-specific expression patterns of the three CaM genes in the adult (1; Fig. 1) and developing rat brain under physiological conditions and certain external stimuli. Our studies also revealed a differential intracellular targeting pattern, e.g. to dendrites, of CaM mRNAs in rat neurons in vivo (1) and in vitro (2). This work relates to my PhD thesis and postdoctoral career under the supervision of Professor and Chairman Karoly Gulya, Department of Zoology and Cell Biology, University of Szeged, Hungary. Sections were hybridized with antisense [35S]-cRNA probes specific for CaM I, CaM II or CaM III mRNAs. A-C: Film autoradiographs of labeled sections (bregma -3.1 mm). D-I: Emulsion autoradiographs depicting the hippocampus–dentate gyrus complex (bregma -3.8 mm). D-F: Overview using brightfield microscopy. G-I: Higher magnification darkfield microscope images of CA2-CA3 areas (box in D). Darker signals in A-F, while brighter signals in G-I represent higher hybridisation, i.e. more mRNA. Re: reuniens thalamic nucleus, Rt: reticular thalamic nucleus, DMH: dorsomedial hypothalamic nucleus, VMH: ventromedial hypothalamic nucleus, Arc: arcuate hypothalamic nucleus, Hb: habenular nuclei, HC: hippocampus, CA1–3: Ammon’s horn fields CA1–3, DG: granular cell layer of dentate gyrus, Py: pyramidal cell layer of hippocampus, HMol: molecular layers of hippocampus. Arrowheads (G-I) indicate labeling corresponding to cell bodies present in HMol. Scale bars represent: 5 mm (A-C) and 200 µm (D-I). Note the relatively high signal in the granular cell layer of dentate gyrus (DG) for CaM I (D) or the stronger label in the Ammon’s horn field CA1 (CA1) for CaM II (E) suggesting differential expression of CaM genes in hippocampal pyramidal cells. 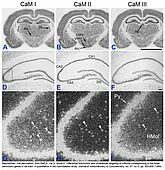 Additionally, the more intense diffuse signal in the molecular layers of hippocampus (HMol) for CaM I and CaM III (A, C, G and I) compared to that of CaM II (B and H) suggests dendritic targeting of CaM I and CaM III mRNAs in hippocampal pyramidal cells. 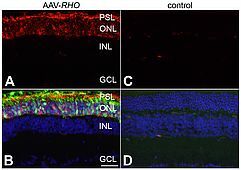 The right eyes of newborn Rho-/- mice were subretinally injected with 3 x 109 vp/eye of AAV-RHO (A and B) supplemented with a 1/10 volume of AAV-EGFP tracer, while the left eyes were un-injected (C and D). Six weeks post-injection, eyes were fixed in 4% paraformaldehyde, cryosectioned (12 µm) and immunocytochemistry using rho primary and Cy3-conjugated secondary antibodies carried out; nuclei were counterstained with DAPI. A, C: Representative microscope images indicate RHO labelling (red). B, D: RHO (red), EGFP (green) and nuclear DAPI (blue) signals overlaid. PSL: photoreceptor segment layer; ONL: outer nuclear layer; INL: inner nuclear layer; GCL: ganglion cell layer; scale bar: 25 µm. Note that RHO is present in both the cell bodies and the photoreceptor segments in the transduced retinas (A, B) while absent in un-injected eyes (C, D). Retinitis pigmentosa (RP) is the leading cause of inherited blindness in the Western world. Although mutations in approximately 50 genes lead to this debilitating disorder, rhodopsin (RHO)- and rds-peripherin-linked autosomal dominant forms of the disorder account for approximately 30% of cases. Initial work in the group of Professors Peter Humphries and Jane Farrar, Department of Genetics, Trinity College Dublin, Ireland, focused on identification of RP-linked genes and later the development of mouse models of RP. I joined the lab in 2000 and was involved in projects leading to the identification of a mutation in the IMPDH1 gene responsible for RP10 (3) and the characterization of the D307-rds-peripherin mouse model (4). Another topic in the Ocular Genetics Unit in Trinity in which I take part is the development of gene therapy strategies towards inherited disorders, such as, different forms of RP. Suppression of mutant RP-mRNA expression by ribozymes (5) and later RNA interference (RNAi) started in vitro. Apart from optimizing suppression agents, suppression-resistant replacement genes are also under development. The applied patented technology progressed from test tube to cell and later retinal organotypic culture (6, 7) and then to mice in vivo (8). A main focus in Professor Jane Farrar’s group is therapeutic development of suppression and replacement technology for RHO-linked autosomal dominant RP, athough, the technology has been validated for other RP genes such as rds-peripherin (7) or, indeed, other diseases such as collagen 1A1-linked osteogenesis imperfecta. 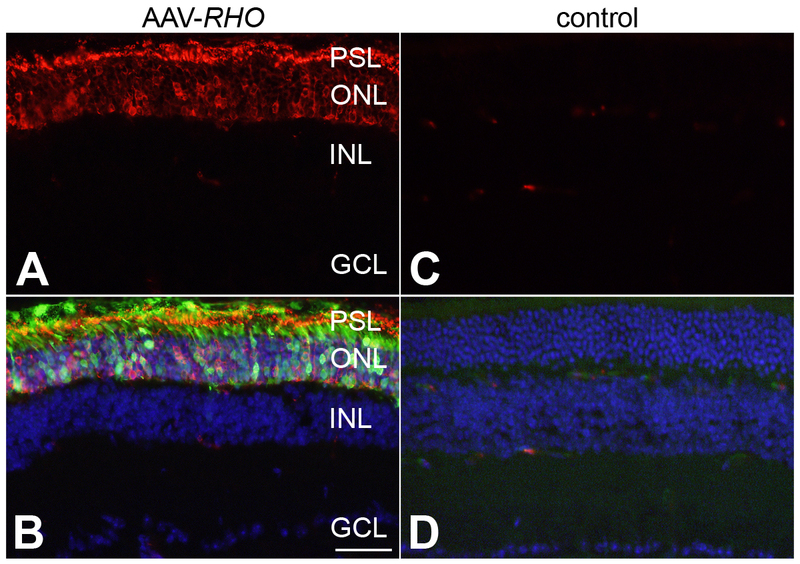 Currently, using recombinant adeno-associated virus (AAV) technology as delivery vehicle to the retina, we are able to provide therapeutic benefit at both histological and functional level in RP mouse models (9; Fig 2). 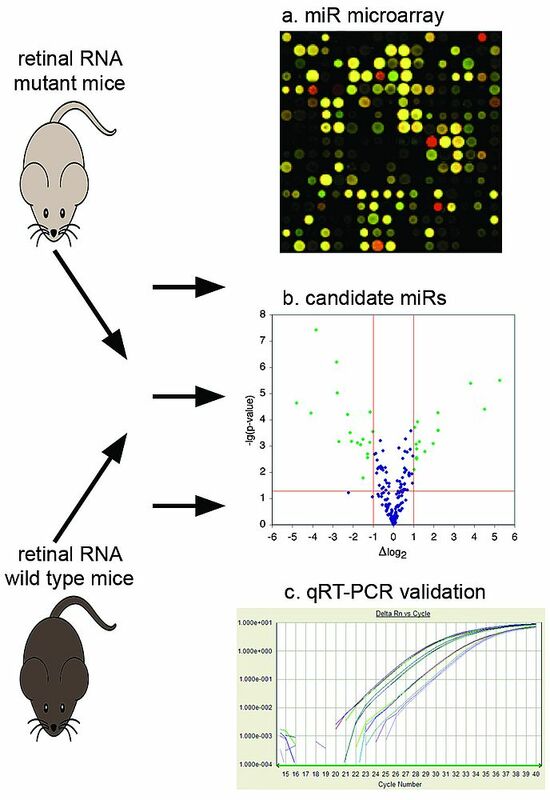 MiR is isolated from retinas of mutant and wild type mice. MiR expression is then analyzed by microarray technology (a). MiRs with altered expression in mutant are identified; in this example green dots in the volcano-plot (b) represent miRs, which are different in expression at least by 2-fold and p<0.05. 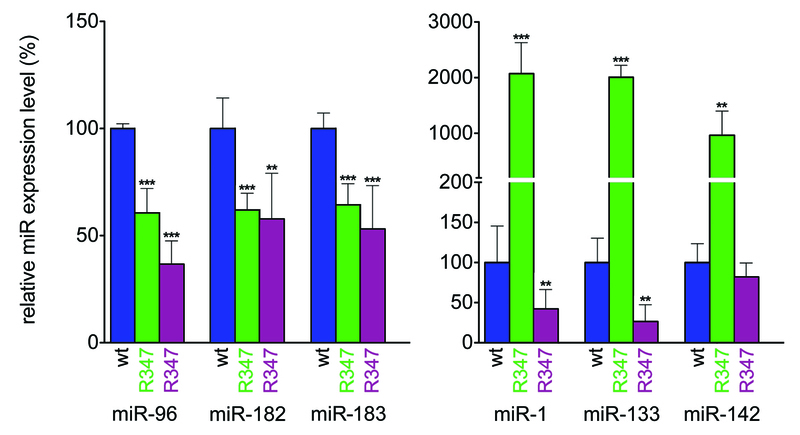 Altered expression of individual miRs is validated by qRT-PCR (c). Retinas from control RGFP+/- mice, i.e. transgenic mice expressing a fusion RHO-GFP protein resulting in green photoreceptor cells and enabling FACS sorting (wt) and RGFP+/- R347+/- (R347) mice were dissociated with trypsin and GFP-positive (rod) and GFP-negative (non-rod) cells were separated by FACS. Expression levels of miR-96, -182, -183, -1, -133 and -142 in the GFP-positive (green columns) and GFP-negative (magenta columns) cells were analyzed by qRT-PCR. Expression levels were normalized to the wild type control (RGFP+/-). **p < 0.01; ***p < 0.001. Note that expression of miR-96, -182 and -183 is decreased while expression of miR-1, -133 and -142 is upregulated in photoreceptors (green columns) in R347 transgenic mice when compared to wild type mice (blue columns). Expression in non-photoreceptors (magenta columns) displays a different pattern. MicroRNAs (miRs) are potent regulators of gene expression and have recently been demonstrated to play a key role in certain disease processes. We have shown that expression of a number of miRs alters in the retina during retinal degeneration in the P347S-RHO (R347) transgenic mouse model of RP (10; Fig 3). Further studies indicated that the observed miR expression profile, i.e. 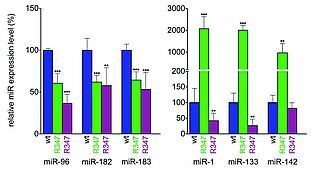 decreased levels of miR-96, -182 and -183 while increased levels of miR-1, -133 and -142, actually represents a common signature at least in some RP mouse models linked to rhodopsin- and rds-peripherin (11). At least in R347 mice these changes are due to altered miR expression in photoreceptors (Fig. 4). In order to understand the mechanisms miRs regulate retinal functions we need to identify their protein targets. In silico predictions provide hundreds of potential targets clearly indicating the need for “wet-lab” based experiments, which should narrow down the number of candidates. I am the PI on some aspects of this miR project carried out in Professor Jane Farrar’s lab. McNally N, Kenna PF, Rancourt D, Ahmed T, Stitt A, Colledge WH, Lloyd DG, Palfi A, O'Neill B, Humphries MM, Humphries P, Farrar GJ. Murine model of autosomal dominant retinitis pigmentosa generated by targeted deletion at codon 307 of the rds- peripherin gene. Hum Mol Genet 2002 May 1; 11(9):1005-16. Millington-Ward S, Oneill B, Tuohy G, Al-Jandal N, Kiang AS, Kenna PF, Palfi A, Hayden P, Mansergh F, Kennan A, Humphries P, Farrar GJ. Strategems in vitro for gene therapies directed to dominant mutations. Hum Mol Genet 1997, 9:1415-1426.